I complain about oversimplification below, but I’ll try to be guilty of the same expanding on Barrett’s Esophagus. The squamous cell epithelium (lining of) your esophagus doesn’t handle low pH and the other abuses gastric acid brings to it when you suffer reflux (which is literally stomach acid slipping past a defective lower esophageal sphincter) very well. The squamous cells undergo metaplasia and change into the columnar epithelium which lines the stomach. It makes sense – exposed to acid the esophageal cells change into cells which are made to be exposed to low pH. Unfortunately, almost across the body metaplasia is a precursor to cancer. Barrett’s esophagus, as a specific type of metaplasia, is a precursor for esophageal adenocarcinoma. 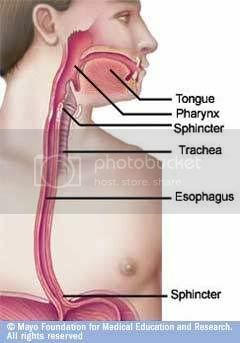 This is the most common type of esophageal cancer in the U.S., occurs typically in the more distal esophagus (closer to the stomach, which makes sense), and is actually the cancer with the fastest growing incidence in the U.S. (which shows just how big of a problem this is). The other major type of malignant esophageal cancer is squamous cell, which has a closer association with alcohol and tobacco use (and as you might expect occurs closer to the mouth typically). Worldwide squamous cell is the most common type of esophageal cancer. Since adenocarcinoma has surpassed squamous cell in the U.S., and adenocarcinoma is associated with reflux and reflux is associated with eating habits and obesity, it shows just how big of a problem nutrition is in this country. For more check out eMedicine’s article on esophageal cancer. Blood pressure can tear holes in your arteries. The way the body repairs the hole is to fill it with cholesterol. And that blocked artery can cause a heart attack. From a patient information perspective there’s nothing wrong with this information. You need to be concerned about high blood pressure. No doubt. But, still keeping it simple, let’s go into how your vessels actually get occluded. Here’s a nice webpage which keeps it simple, but a little more specific than what ABC has published. The problem is that it is complicated, and actually poorly understood how this process gets started. However, the way I’ve been taught, it is probably not completely accurate to say that the arteries get damaged by high blood pressure and then a cholesterol scab forms. Cholesterol collects in “fatty streaks” in your arteries from when you’re a kid. The process is poorly understood, and complicated. The LDL cholesterol becomes oxidized, and damages the endothelium (lining) of the vessel. Not entirely analogous, but think about how damage to your skin, say a cut, causes a little swelling and redness around it (inflammation). 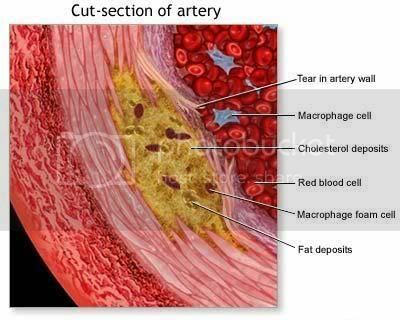 Monocytes/Macrophages come into the area, and consume the cholesterol, trying to remove the offending agent. They eventually die. These dead macrophages, now called “foam cells,” cause an even greater inflammatory response. Eventually substances released from inflammatory cells in the area cause the smooth muscle cells in the endothelium, around the cholesterol plaque, migrate over the wound and cover it. These cells can die, once they’ve covered the plaque, and eventually you get a fibrous cap over the plaque and the entire thing is now called an atheroma. So let’s see what we have. A core of cholesterol and dying inflammatory cells, covered by a fibrous top which protects the core from the blood in the artery. The major problem with high blood pressure is that eventually it will physically tear open these atheromas. These cholesterol/foam cell cores are very thrombogenic. What that means is they promote clot formation. So, when you cut yourself, a complicated set of reactions lead to a clot forming to stop the bleeding. You can imagine how terrible it would be if a clot formed in the inside of an artery. But high blood pressure, cracks open the fibrous cap of this atheroma, and a clot forms on the core. While it is my impression there is still some lack of understanding about how the process gets started, it is almost universally accepted that the thing that actually leads to the entire vessel getting blocked (and thus a heart attack or stroke) is the formation of a clot. Rarely, if ever, does the atheroma get so big itself that it occludes the artery. So the real reason high blood pressure is a terrible contributor to heart attacks is that it physically opens up these atheromas, allowing the formation of clots within arteries (which is not a good thing).